In late summer and early fall, when I had some open time on a weekend or we were visiting the mountains, I found myself bringing the mountain bike more than previous years. It's been a great change of pace, and, frankly, blasting through wildflowers across tundra or forest trails covered in golden aspen leaves on a bike is about as good as it gets. For trail running some of the best trail runs end on mountain summits. But for bikes, some of the best roads and trails may not go to proper summits, but instead traverse across saddles and passes. Getting back on the bike this year when I could, I found myself seeking out a few new (for me) bike-accessible passes. Here are some of them. While J was in Breckenridge for a work meeting, I took a jaunt up to Wheeler Pass, which goes straight up through Breck ski area, then drops down the other side to Copper, before returning on the bike path. (With more time, which I didn't have, taking the Peaks Trail between Frisco and Breck would add more dirt). I followed the guide and map from the SummitDaily free Bike Guide -- these magazines are ubiquitous in Summit County and convenient for ideas and tearing out the page you need, but sometimes the directions are a little sparse -- mostly, it's written for people who seemingly already know which way the ride goes. For example, this ride goes under a "quad lift" and then "another quad lift" whereas the simple addition of the lift names might have been helpful. So it was that I headed too far over before finally making my way up to what I hoped was Wheeler Pass. Indeed it was, and it was nice to see the weather breaking, as did my mood after spending too much time trying to figure out if I was going the right away. I enjoyed a heavenly slice of banana bread that I brought from La Francaise before heading down. The backside had a different feel as it dipped into the woods, with the recent monsoon moisture making it feel more like the PNW. Some ruts and switchbacks slowed down the flow a bit but all in all it was a great descent followed by the cranking the bike path to finish the loop. Also while in Breckenridge, one of J's coworker's husband brought his bike and was up for a ride, so we decided to head up French Pass, again using a Summit Daily description. One could drive up a bit toward the pass but we enjoyed the warmup straight out of town (so much that we missed Wellington Rd. altogether and took 450 -- at the corner by the 7/11 -- straight up French Gulch instead). A stream crossing got things nice and wet, and things were still marshy up high, with a little hike-a-bike in the mud, but ultimately it was another gorgeous place to be up high. Dropping down the other side looked enticing, as did a ridge run along any of the nearby Class 2 summits, but instead we headed back the way we came. Well this was a fun one and nice surprise. I knew that Searle and Kokomo was a great section along the Colorado Trail, but it seemed a modest half-day ride would need to be an out-and-back. Instead, though, I saw an intriguing loop called the Copper Dirty Triangle, which is a fun play on the classic 80-mile road bike ride (much like the Morgul Bismark vs. Dirty Morgul Bismark near Boulder). While the trail version is about 45 miles shorter, it's more of a technical and aerobic challenge. And routefinding, as following the Colorado Trail across Copper Mountain gets tricky in a few areas. Of course, logically, it's a good bet that Kokomo ski lift is named for a nearby geographical feature, and indeed that's the side of the mountain you want. As an aside, having ridden or run in summer on over a half dozen ski areas by now, I've had the frustration of ski area summer map and trail situation: summer trails are given new and unsigned names on "Summer Maps" despite large coincidence with downhill ski runs; more importantly, summer maps often lack detail on useful landmarks like ski lift names, ski runs, structures, and topographic features. But I digress! And it wasn't too bad once you get the idea of heading straight across Copper. The thinning air and occasional steeper sections made for honest work. Eventually, up high, I saw a helicopter buzz by a few times, and I immediately became concerned about a rescue mission -- especially when I saw something dangling below. It turns out, it was an annual re-supply flight to the nearby Janet's Cabin ski hut. More rolling terrain as I approached and then crested Searle Pass. And more rolling still toward Kokomo Pass, above 12k feet. I'm glad I crested Kokomo, rather than an out and back, because the descent was fun and I was treated to a gorgeous carpet of colourful tundra. The trees in Camp Hale were starting to change as well. This really ended up being a great choice for mid-September, as being one of the first areas to change noticeably, days or even a week or more before some of the other classic areas started peaking. There's a few miles of flat through Camp Hale, and then the final grueling climb up Resolution Road. Be forewarned, this section is shared with ATV's and motorized traffic, and is relatively unshaded. Supposedly the next gulch over is steeper and shorter, but I didn't take the time to see how these might have connected. I finally made it to the top, then began the descent on dirt road, keeping my eyes peeled for the quickly-approaching trail that branched off to the right along a switchback, necessary for making the loop. This trail wasn't as hard to spot as I thought, and I chatted briefly with a few hikers visiting from the east coast, envious of all of Colorado's great trails. Only a few miles remained on singletrack, which became waterlogged and overgrown in a few spots, but was also resplendent with Colorado colour. I stayed right at a fork, and although unnamed in the description and on the signs from this direction, it is the Wilder Gulch Trail. Now I had a quick descent down the Vail Pass bike path to finish the loop. Even the colour here made it worthwhile, and even though this is a classic road bike section, it's nice to fly down fast pavement confidently on cushy fat tires. I did red mountains. My head is on a swivel when we drive through the San Juans, over Red Mountain Pass, for example -- yet I haven't been up Red Mountain 1/2/3, or even the aesthetic 14er walkup of Redcloud. I guess I like to look at them from below. Much closer to home, though, is Red Mountain near Webster Pass, between Montezuma and Jefferson. A rocky jeep road leads up from either side. In this case, I made a loop from Montezuma, tacking on Webster Pass as an out-and-back, and then taking Deer Creek back down. I guessed correctly that the colder weather and recent snow would cut down on the motorized traffic that usually infests the area in the summer. But it also made things tougher for biking, with most of the switchbacks up Webster Pass covered in pedal-deep snow. The drifts are made worse by snow-fencing and the fences put up to keep motorized traffic off of re-vegetated areas, so the protective fences actually end up keeping more snow on the road itself. The snow and wind was cutting into my schedule, so I didn't actually get up on top of the mountain. 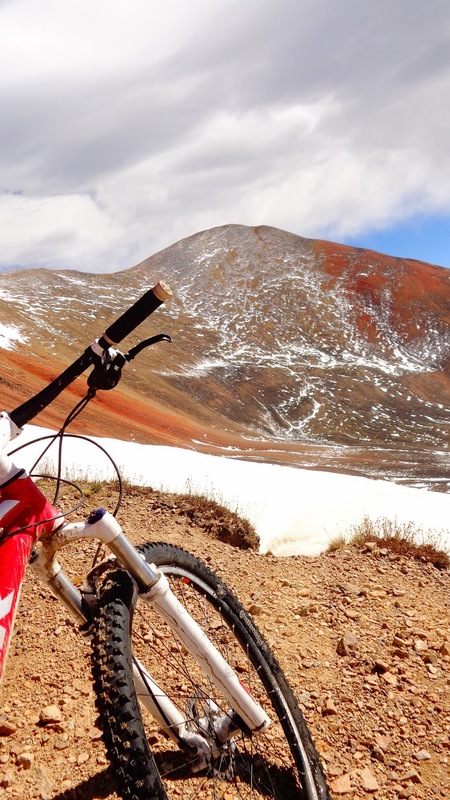 Still, it was worth the slogging hike-a-bike up to Webster Pass for the views of Red Mountain. After descending the pass, I needed to regain as much elevation toward Teller Mountain to complete the loop, and in fact the climb up the ridge, while without a named pass, was even higher and more challenging on and eroded and steep mining road. Again, though, it was worth it for the view. The trail rolled along the divide further, but I cut down into the trees in Deer Creek, unable to feel my feet which had been wet for the last several hours. Still, I was grinning at the prospect of the coming winter. Even though I'll curse it come March or even late February, it's always exciting when it's new. What are some of the other great passes in Colorado? Tomichi Pass-White Pine between Salida and Gunnison is probably tops on my to-do list right now. Awesome! I'll put some of these on my list for next year.